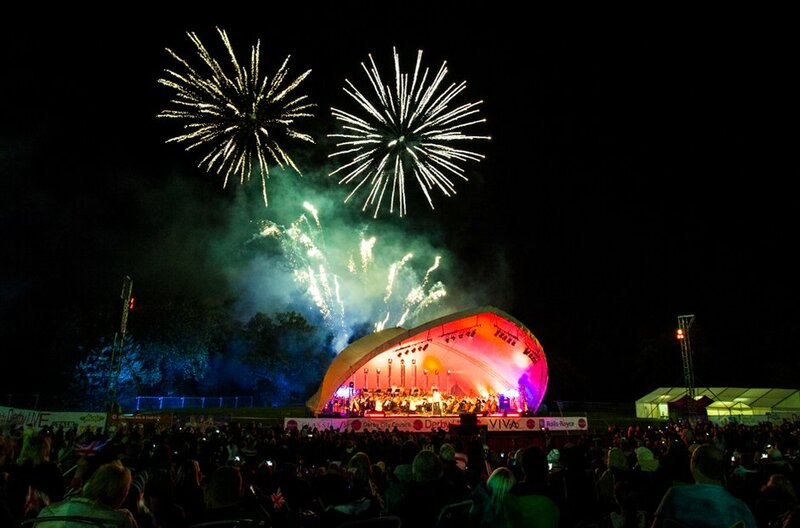 It was one of the biggest classical concerts of the summer, with over 30,000 people descending on a beautiful Derby park to hear the fantastic Sinfonia Viva orchestra - and Classic FM's Nicholas Owen was the host. Classic FM's Nicholas Owen hosted the Darley Park Concert in Derby, while the wonderful Sinfonia Viva provided the music. Early birds arrive at the Darley Park Concert - the first of an estimated 30,000 crowd who have come to hear the fantastic Sinfonia Viva. Karl and the Marx Brothers warm the crowd up with some pre-concert entertainment. Sinfonia Viva tune up in preparation for one of the biggest classical concerts in the UK: the Darley Park Concert. Sinfonia Viva prepare for one of the biggest classical concerts in the UK: the Darley Park Concert. Tenor Oliver Johnston and soprano Rosalind Coad sing at the Darley Park Concert. One of the biggest outdoor classical concerts in the UK in Derby's beautiful Darley Park. Classic FM's Nicholas Owen hosted one of the biggest outdoor classical concerts in the UK in Derby's beautiful Darley Park. Tenor Oliver Johnston sings at the Darley Park Concert. Fireworks bring the Darley Park Concert to an end.